I never went to see those fake professional wrestling matches as a kid, but caught a fair share of Wrestling At the Chase on KPLR-TV Channel 11 out of St. Louis growing up. Nothing about the sport ever captivated me very much, like it did so many others my age. 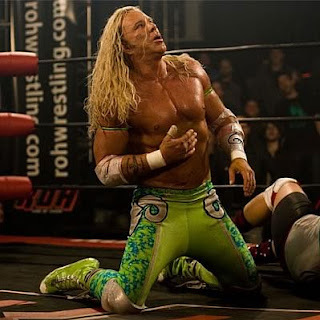 And nothing about Mickey Rourke's (Body Heat, Diner, Buffalo '66) character as Randy "The Ram" Robinson is redeeming, which is why it's amazing that you can't take your eyes off him in The Wrestler. Marisa Tomei, as his love-interest stripper girlfriend Cassidy is an only-slightly-more-redeeming character. But she is equally impossible for the eyes to dismiss. She's just about perfect in ever way, in fact. This movie is a tiny little tale with a classic '80s hair-metal soundtrack, and a Golden Globe-winning best song by working man Bruce Springsteen, that builds into a powerful, larger drama about the thin line between choosing between what you love to do and committing to something (anything) besides yourself. And the scenes when Randy (don't call him Robin) works at the deli counter are hilarious and help to further humanize The Ram. Even the brief scenes of fake wrestling matches are gripping and shed light on a world well worth getting acquainted with for an hour and 45 minutes.